After stabilizing due to legislative changes, Illinois’ contributions to its severely underfunded retirement systems are expected to resume their climb in the upcoming budget year. 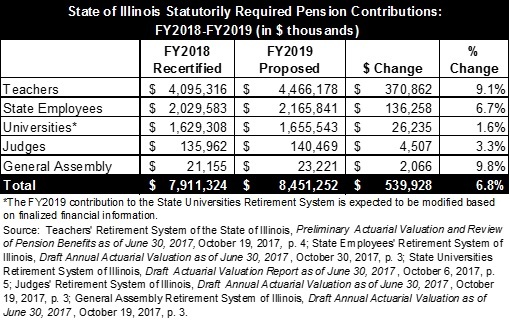 Proposed State contributions to the five pension funds rise by $539.9 million to $8.5 billion in fiscal year 2019, which begins on July 1, 2018. That represents an increase of 6.8% from $7.9 billion in FY2018. Because of recent changes in Illinois pension law, the FY2018 amount is only 1% higher than the $7.826 billion approved in FY2017. The FY2019 numbers are preliminary contribution amounts certified by the retirement systems’ trustees last month. The numbers will not be final until the State Actuary completes a review of the calculations by January 1, 2018. Final certified contribution amounts from the systems are due by January 15 so they can be included in the Governor’s FY2019 budget recommendation in February. 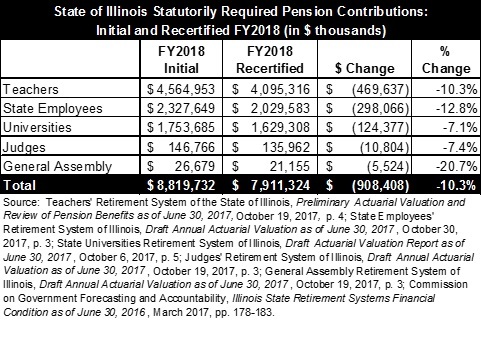 The following table shows recertified FY2018 and proposed FY2019 contributions to the five funds: the Teachers’ Retirement System (TRS), State Employees’ Retirement System (SERS), State Universities Retirement System (SURS), Judges’ Retirement System (JRS) and General Assembly Retirement System (GARS). The numbers above are total State contributions, including payments from both general operating funds and other State funds. Approximately 89% of total pension contributions come from General Funds. FY2018 contributions were reduced significantly because of funding policy changes included in budget legislation for the year that began on July 1, 2017. The reduction relieved financial pressure on the FY2018 General Funds budget, which is still projected to have an operating deficit of at least $1.5 billion. The main change in Public Act 100-0023 involved smoothing of State contributions, which is intended to moderate the budgetary impact of new actuarial assumptions adopted by the retirement systems. Beginning in FY2018, any change in required State contributions due to revised actuarial assumptions is recognized equally over a five-year period instead of all at once in the year they take effect. The smoothing also applies retroactively to changes in actuarial assumptions that first affected State contributions during FY2014 through FY2017, which means that the State will reduce FY2018 and future contributions by the amounts that were previously overpaid. Revised assumptions such as lower assumed rates of investment return increase accrued liabilities and raise State contribution requirements. Smoothing spreads the contribution increase over a number of years, reducing State costs in the near-term but increasing costs over time due to forgone interest on lower contributions. TRS, Illinois’ largest pension fund, said the State will have to pay $3 in the future for every dollar in current contribution reductions. Before the smoothing provisions were enacted on July 6, 2017, changes in actuarial assumptions by TRS and SERS had been expected to increase the State’s FY2018 contributions by nearly $1 billion. TRS, which covers public school teachers outside of Chicago, reduced its assumed rate of investment return to 7.0% from 7.5%. SERS lowered its investment return assumption to 7.0% from 7.25% and raised its projections about future life expectancy. Public Act 100-0023 also shifted certain costs for high-paid employees from the State to local employers. Individual school districts, universities and community colleges are now required to pay current service costs for the portion of employees’ salaries in excess of the Governor’s salary, which is currently $177,400. Another provision of the law that would shift additional costs to school districts, universities and community colleges is not expected to take effect until FY2020. The measure would create a new Tier 3 benefit plan for new employees, with costs covered by local employers. The next table compares initial FY2018 contribution amounts with revised amounts due to legislative changes. The revisions decreased FY2018 contributions by $908.4 million, or 10.3%, to $7.9 billion from $8.8 billion. The revised FY2018 contribution for TRS was also affected by another legislative change in the opposite direction. Public Act 100-0340, enacted in August 2017, shifted more of the pension costs of federally funded teachers’ salaries from local school districts to the State. The use of federal Title 1 funds, meant for low income students, to pay for pension debt has been criticized by school districts and advocates for the poor. The legislative change means that school districts’ federal funds will be used only for current service costs of pensions and not to help pay down unfunded liabilities. The federal funds spent on teachers’ pensions will decline by $56.1 million in FY2018 to $21.1 million from $77.2 million in FY2017 and State contributions will increase accordingly. For SERS, the actual State contribution in FY2018 is expected to be below the revised figure of $2.0 billion in the tables, according to system officials. SERS certifies a specific percentage of payroll as the required State contribution; for FY2018, the percentage is 45.424%. The actual contribution is expected to be about $1.9 billion because of a decline in payroll based on the updated actuarial valuation. Similarly, SERS’ FY2017 contribution was certified at $2.0 billion, but the State actually paid $1.8 billion. Pension contributions are expected to increase each year under the State’s 50-year funding plan that began in FY1996. After a 15-year phase-in period, the law requires the State to contribute a level percentage of payroll sufficient to bring the retirement systems’ funded ratios to 90% by FY2045. A funded ratio shows the percentage of accrued pension liability covered by pension assets. Total proposed contributions in FY2019 of $8.5 billion are still below the previous projection of $9.0 billion. But because FY2018 contributions were reduced so significantly by smoothing, the increase between the two years is particularly steep.